Just as patterns show a rhythm to the way that the prices move, so we can find regular cycles in the price charts. Identifying these gives us further clues as to how the prices may move in the future, and can improve our trading. Another form of pattern is the Elliott wave theory. This is more general in its application as it describes the form which you expect the price curves to take. Before going into any detail, I would point out that, although it is much praised by its advocates, the Elliott wave theory is often difficult to interpret, with different traders “seeing” different things. Price curves are seldom as clear-cut as the examples that are drawn, so interpretation becomes a large factor, particularly as in this case when you’re looking at many ups and downs. In its simplest form, the idea of Ralph Nelson Elliott which he invented in the 1930s is that stock market prices tend to follow a repetitive pattern. Nothing very mystical about that, it’s virtually what Charles Dow wrote about some decades before, except Elliott tried to quantify it. In fact the reason Elliott called it the “Wave Principle” is because Dow referred to the motion of the sea when he described price movements. Elliott saw his ideas as building on those of the Dow theory. I’ve numbered and lettered the waves in the conventional manner, so you can see the five waves advance and three waves (A to C) decline. Even though I’ve shown this in an up-trend, the same applies in a down-trend – five waves down, followed by a three wave retracement up. You can see that wave one of the first diagram is made up of five smaller waves, wave two breaks down to three smaller waves, and you have a miniature version of the first diagram. This repeats to form waves three and four of the first diagram, and is there’s another five small waves before the reversal. In the retracement A and B we see the five and three pattern again, followed by another five to finish the shape. And so you can go on in theory, scaling up or scaling down, and getting the same patterns again. These can be compared to the Dow Theory primary trends, secondary trends, and minor trends – the wave theory is simply a way of graphically restating the Dow Theory. There are a couple of terms you should know. 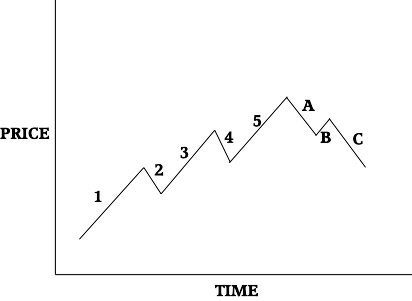 When a wave is in the direction of the trend, such as one, three, and five in the first diagram, it is called an “impulsive wave”. When the wave direction is against the main trend, as are two and four, it is called a “corrective wave”. Similarly, A and C are impulsive waves and B is a corrective wave in the following downtrend. Elliott didn’t specifically state this is the only form of pattern, but it is the dominant form and any different patterns can usually be accounted for as part of this form. In practice Elliott practitioners assert that the time-frame of this pattern can be anything from a few hours to many years. The theory says that regardless of the size the complete stock market cycle is made up of eight movements, five waves making up an impulsive move and three waves in a corrective direction. In fact, the second diagram can be numbered as 5-3-5-3-5-5-3-5 for the number of component waves. Now if you want to base all your betting on Elliott Wave theories, there is extensive information available on the Internet in trading groups and in many published books. In this section you will become familiar with the pattern variations that Elliott proposed, which will give you a basic grounding and knowledge, but you should know there is a great deal more complexity available for the aficionado. There are a number of rules or guidelines that are usually set down for the Elliott Wave Theory. Some of the problems that are perceived with Elliott waves come out of these, because they are sometimes presented as hard and fast rules. It is better to look on them as a framework while understanding that the markets really don’t permit anything to be stated with certainty. 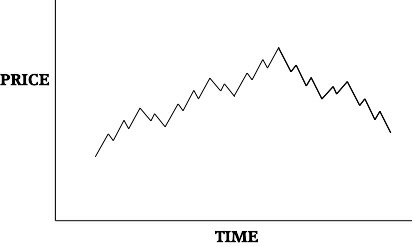 The first guideline is that the expected price cycle is not complete until the 5-3 pattern has been finished. Time is unimportant – waves are identified by movement in the price direction, up and down. Wave 3 in a five wave move is never the shortest, and is usually the longest of the five waves. Looking at the three impulsive waves in a five wave move, two of them are usually the same length (often one and five). The two corrective waves in a five wave move also usually tend to be equal. Wave 4 will never come down below wave 2 – you need to rethink where your waves are if this seems to be the case. You will also often see that the fourth corrective wave equals the first impulsive wave, and the second corrective wave equals the fifth impulsive wave. Looking now at the retracement movement, the A-B-C part, you will find that A and C tend to be equal. Wave B should never retrace all of wave A. You should look for the ABC retracement to typically lose one third of the wave 1 to 5 advance. C will tend to stop at the level of 4 connecting to 5, that’s the low point of 4 in an uptrend. Sometimes wave 4 will appear as a triangle or pennant pattern. The chief difficulty with identifying the Elliott wave patterns is in the ABC correction – the wave 1-5 advance is usually easier to spot. The ABC correction can also be broken down into more detailed patterns to help with identification, and these are called the zigzag, the flat, and the triangle corrections because of their respective shapes. For the past 12 months I have been testing a theory. It has to do with Elliott Wave, but I have not been keeping a count…which would seem to fly in the face of using Elliott Wave at all. I have been very interested in Elliott Wave for a couple of years now, but I do have to say, the part I like about it the least, is the use of labels and counting waves. But later exponents of the Elliott Wave have tried to bring volume analysis into the equation. Even though Elliott hardly talked about it, this may be one reason that some people dismiss the Elliott Wave Theory as a failure. Volume does tend to support a bull trend, and when volume becomes light it is an indication of market indecision, and therefore a possible turning point. A further indication is when volume runs counter to the apparent trend, strengthening on retracements. It’s interesting that William Gordon, in The Stock Market Indicators said that “In 84 percent of the bull markets the volume high did not occur at the price peak but some months before”, adding weight to the idea that you can expect to see a lessening in volume before a trend ends – in other words, reduction in volume can be an early indication of a failing trend. From the Elliott Wave perspective several commentators have corrected Elliott’s apparent shortcoming and provided their own explanations of the relationship. The volume relationships are generally as you would expect from your knowledge of the significance of trading volumes, and here is a detailed explanation through each wave. Volume generally increases during the first wave, contracts in the second, increases in the third, contracts in the fourth and may reach new highs in the fifth. The volume in the second wave should be much less than in the first; the volume in the third will usually exceed the first. In the fourth wave, again you can expect a decrease from the previous, in this case third wave, but volumes should be greater than in the second wave. The volume at the end of the fourth wave is still fairly high, and the fifth wave is the greatest volume. By looking for the volume indications, you can sometimes find it easier to identify the different waves. Trader Comment: If one can predict the market with Elliot Waves, why aren’t there any Elliot Wave billionaires out there? Lol, with leverage this would surely be easy if they knew the exact pattern prices were likely to follow? It’s not something where you can say it’s being competed away either, Elliot Wavers are a rare breed, the market on a whole doesn’t believe it’s a system that works – surely the conditions are perfect for an Elliot Wave technician to easily become vastly wealthy in the stock market? To the point where we’d all be trying to use Elliot Waves, and the investment banks of the world would have entire departments dedicated to this type of analysis? I’m a little sceptical as you can guess lol, but I’m naturally curious as to how they perform in real-time, would be delighted to hear from a successful practitioner with a track record.